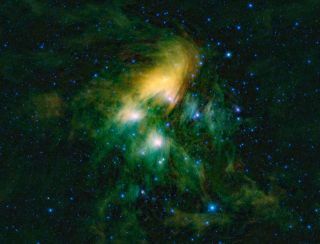 This image shows the famous Pleiades cluster of stars as seen through the eyes of WISE, or NASA's Wide-field Infrared Survey Explorer. The mosaic contains a few hundred image frames - just a fraction of the more than one million WISE captured during its first complete survey of the sky in infrared light. "The WISE spacecraft will remain in hibernation without ground contacts awaiting possible future use," NASA officials said via Twitter. WISE launched on Dec. 14, 2009 to begin a 10-month mission to collect data to be stitched together into a composite map of the entire sky. The spacecraft surveyed the cosmos in infrared light, which allowed it to peer through dense layers of dust to capture stunning space photos of previously unseen objects in unprecedented detail. In addition to spotting asteroids and comets, the $320 million space telescope is designed to detect the faint glow of distant objects, such as strangely cool brown dwarf stars. Over the course of its mission, WISE scanned the sky 1 1/2 times, taking about 1.8 million images of asteroids, stars and galaxies. The spacecraft also spotted 19 previously unseen comets and more than 33,500 asteroids, including 120 near-Earth objects, which are objects with orbits that pass relatively close to Earth's own orbit around the sun. In late September 2010, WISE ran out of the coolant needed to chill its infrared detectors. The observatory then began an extended mission, dubbed the NEOWISE Post-Cryogenic Mission. Without coolant to prevent its instruments from warming up, WISE operated on two of its four detectors, training its eyes on objects within our solar system. Since the spacecraft and telescope were in good condition prior to mission's end, Wright proposed a three-month extension in order to complete the second half of the observatory's second sky survey. In May 2010, a NASA panel advised against the extension, however, which would have added $6.5 million to the program's price tag.